Country Heart Beats | Doing it our way … one day at a time. Country Heart Beats Doing it our way … one day at a time. I haven’t updated my blog in quite a while. My beloved garden fell victim to the Texas drought – – my squash plants had already been victimized by squash borer worms. Depressing. Yesterday was a busy day! I made corn cob jelly & put up some bread & butter pickled squash. 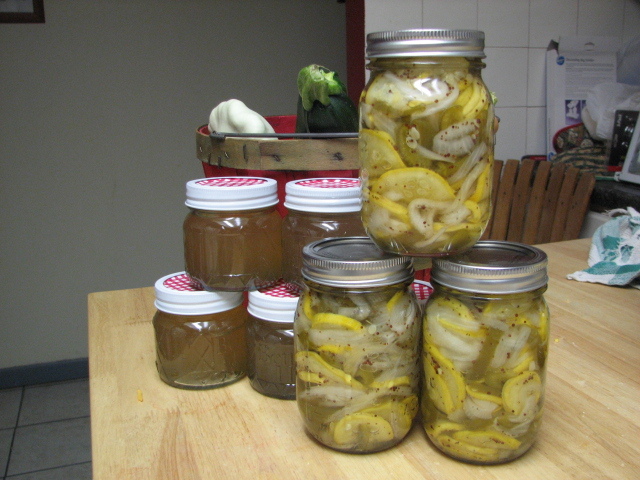 The sqush were from my garden – but I had to buy the peppers & onions … mine aren’t ready yet. Corn won’t grow in my garden so I bought that too. I ran across the recipe on another blog I read … Chickens In the Road .. and just HAD to give it a try. I found others on other sites .. cooks.com .. food.com .. tasteofhome.com … but they’re all pretty much the same. as wasteful as we often are today. Cook corn; cut kernels from cobs and store for another use. Measure 2 quarts water into a large pot; add corn cobs. Bring to a hard boil for 30 minutes. Turn off heat and remove cobs. Strain corn liquid through cheesecloth or a fine mesh strainer–if desired. Measure remaining corn liquid. I boiled mine down to 5 cups. Return liquid to the large pot and stir in the 2 T of lemon juice and pectin. Bring to a boil and then add sugar cup per cup to the liquid (5 cups sugar for 5 cups corn liquid) . Bring pot to a rolling boil and continue to boil hard for one minute stirring constantly. Remove from heat and ladle into hot jars. Adjust lids and bands and process in hot water bath for 10 minutes. This jelly tastes suprisingly like honey! It’s a perfect example of “waste not want not” … and is absolutely DELICIOUS! Do not peel squash. Slice squash, onions, and green pepper in thin strips. Sprinkle with the 2 T of salt and let stand for one hour or overnight in the refrigerator. Combine sugar, vinegar, celery seed and mustard seed and bring to a boil for 3 minutes , stirring occasionally. Drain squash mixture and then add to the pot with the liquid. Bring to a boil and then pack in hot canning jars – fill to 1/2 inch of top of jar with juice. Makes about 4 or 5 pints. Recipe can be doubled. I decided to try making lye soap – and I had no idea that lye was so hard to find ! It seems that lye is used to make meth so a lost of stores have stopped carrying it …. or *don’t know* they carry it because the bottle doesn’t have big bold letters saying it’s 100% lye. I called every store in Lufkin and was told “no we don’t carry lye” every time. But, not wanting to have to pay the high shipping it would cost to buy online …. I decided I’d go check at Lowe’s anyway … and low and behold .. the Soap Gods smiled down on me and I found 1 bottle of Roebic Drain Cleaner! YAY!! There is an little oval shaped bubble on the side of the label that says 100% lye and I checked the ingredients also to make sure it was 100% sodium hydroxide. Home Depot probably carries the same brand too – but since I didn’t need a mass quantity, I didn’t go there to check. I put together a recipe and ran it through soapcalc -and I’m totally LOVIN’ it! It had a odd smell after it was cooked but today it smells (and looks) like caramel without the use of any added fragrances or colors! I added 1 cup of ground oatmeal as a mild exfoliate. I used it this morning in the shower and even washed my hair with it. I have very thin/fine hair and conditioners usually leave my hair feeling weighed down or greasy so I don’t like using it if I don’t have to. So far I’m loving the results of this soap! I’m so proud of my garden! I think it’s absolutely BEAUTIFUL!! I picked a few yellow squash, one zucchini, some turnip greens & lettuce yesterday. YUMMY! Everything seems to be doing so much better than last year. I don’t know if it’s the lime I put down in the Fall or the fish emulsion I’ve been using to fertilize with …. or the combination of the two. Either way .. I’m happy with the results! The lot is unlevel and water drains to the left and back which was creating a problem with the PVC pipe irrigation we rigged up. So we got some weeping type flat hose and ran down the rows that we were having problems with. I only have to hand water the front beds, the greens bed & the potatoes. I’m using the Florida Weave method of tying up the tomato plants and so far I like it. I’m using last year tomato cages on the Anaheim pepper plants, tomatillos. Honestly, I HATE tomato cages. They are so hard for me to get pushed into the ground and most of the time I end up having to stake the plant anyway because the wind seems to manage to blow it all over. The pepper plants should be fine though since they won’t get nearly as big and heavy as a tomato plant. Every afternoon, when I get home from work, I go to the garden to see what has changed. It never ceases to amaze me how fast plants grow! Last year I planted potatos in the main garden area and they rotted in the ground. This year I decided to try growing them in trash cans. I put about 6 inches of dirt in the bottom of the can and put the seed potatos in then covered them with about 2 inches of dirt. I’ve added more dirt as the plants grew. The red russets can is now full and the plants are over the top!! I planted the Yucon Golds about 2 weeks after the red russets but it won’t be long before they’ve caught up. We finished up the irrigation system .. still have to tweak it a bit because the ground isn’t level – but it’s working for the most part. Watering takes less than 30 minutes and uses a lot less water than the sprinkler we used a few years ago. Everything is looking great and I’m sure we’ll have more tomatoes than we know what to do with. We’ll share with our family & friends and I also plan on donating to the local Salvation Army soup kitchen & Senior Citizens Center. We have several varieties of tomatoes, yellow squash, zucchini, pickling cucumbers, lemon cucumbers, sweet pea pods, eggplant, bell peppers, several varieties of hot peppers, okra, purple hull peas, onions, strawberries, radishes, beets, turnip greens, salad mix veggies, and cantaloupe. I’ve never been able to successfully grow cantaloupe in this garden but I’m trying a new area that is mostly sand type soil .. so we’ll see how that goes. I planted an heirloom plant called a Ground Cherry last year and it’s supposed to self seed. I’m anxious to see if any come up on their own this year. I also have bird house gourds planted on a trellis/fence in line with the Giant Thuja baby trees. They’re just starting to break ground – but soon they’ll start putting out runners and cover the fence. They’re so pretty when it’s all in bloom! Cook on a double boiler – have water boiling before you start mixing. Beat with an electric mixer at high speed until the icing is in peaks. Another busy weekend at the Hankins house. Friday we put up the new bat house we bought for the garden lot. We put one up in the backyard 3 years ago. Last year we were excited to see we had a small colony of bats in the house. It was so exciting to sit on the back porch at dusk and watch them drop from the house and soar away. We counted 20 as they dropped from the small house 2 weeks ago, and not knowing how many will fit in the house .. decided to order a new one to put over on the garden – and hopefully if our current house gets to croweded the overflow will move into the new house. I got the houses from Marion Holley’s ebay site. I love his marketing tag .. WMMD – Weapons of Mass Mosquito Destruction! The houses are very well built. It has a birth chamber and a baby catcher board on the bottom to keep the little ones from falling to the ground if they lose their footing. We also put together a new playset for the grandbabies. We freecycled the trampoline we had . The mat was stretched and a new one would cost more than the trampoline did a few years ago. The new ower is going to repurpose the frame into a bunny pen. The new playset will get more use and doesn’t take up that much more space than the trampoline did. We bought it at Walmart – it came in 2 very heavy long boxes and it was a bit overwhelming when we opened the boxes. OMG .. it’s a good thing my husband and I love each other so much … a project like this can sure cause a lot of grrrrrrr attitude. But, seeing the kids having so much fun made it totally worth the skinned, bruised knuckles and sore muscles. ABC News Nightline Story "What's Wrong With Carter"